You are currently browsing the archive for the Aleks Pluskowski category. In July, a team consisting of staff and students from the University of Reading (Aleks Pluskowski, Rowena Banerjea, Guillermo García-Contreras Ruiz, Rob Fry, David Thornley (formerly at Reading) and Caedmon Bradley), students from the universities of Granada and Montpellier, spent a week in the province of Guadalajara, central Spain, prospecting and surveying two castles associated with the medieval Christian – Muslim frontier. 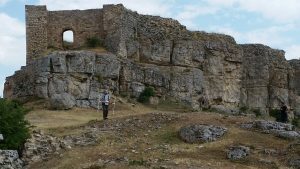 The project was funded by the Society of Antiquaries and the Erasmus Programme, as pilot studies within the “Landscapes of (Re)conquest project” which is investigating the character of medieval frontiers in South Western Europe. The central part of the Iberian Peninsula represents an exceptional area for investigating the dynamics of frontiers, colonisation and social reorganisation during the formative period of the Middle Ages, when political control of territory fluctuated between Islamic and Christian authorities. Our fieldwork focused on two castles – Molina de Aragón and Atienza – that were linked to medieval frontier authorities during both Islamic and Christian periods of rule. Both sites are defined by the presence of substantial enclosed wards, largely devoid of structures above ground. The use of these spaces and therefore the roles of these fortified sites during the various phases of occupation remain unknown, and the complete lack of palaeoenvironmental investigations has also detached them from their landscape context. The aim of the project was to conduct geophysics surveys within these wards, to obtain environmental data from excavated irrigation channel and terrace within the vicinity of the sites, and to collect samples of building fabric and document phases of construction. This information would be used to characterise how the landscape was used and organised by Islamic and Christian frontier authorities. Most of our fieldwork was focused on Molina de Aragón, which consists of a fortified complex, located on a hill overlooking the valley of the River Gallo in the Upper Tagus, one of the principle mountain ranges in Spain and recently designated as a UNESCO Global Geopark due to its unique geological formations. The role of the site changed over time, from a rural fortification during the Islamic period, ruled largely by Berbers (8th–10th centuries), to a focal point for the defence of Al-Andalus against the expansion of Christian kingdoms from the north (10th–11th century) and subsequently the capital of an independent Islamic state, the Taifa of Molina, following the collapse of the Umayyad Caliphate. In 1129, Molina was conquered by King Alfonso I of Aragon. After fierce territorial disputes, it was bequeathed to the Lara family who maintained a virtually independent frontier lordship into the 14th century and developed the associated town. Molina passed to the Kingdom of Aragon for a short period (c. 1366–1375), after which it was incorporated into Castile, and finally into Spain. After functioning as a military barracks throughout the 19th century, the fortress was abandoned from the beginning of the 20th century. Rob Fry and David Thornley conducted magnetometry surveys within the wards of the castle, whilst the rest of the team focused on excavating and sampling an irrigation channel at the edge of the medieval town, taking cores to identify suitable deposits for further environmental sampling and sampling a terrace for OSL dating and geoarchaeological analysis. Environmental sampling was led by Rowena Banerjea with students from Granada and Montpellier. 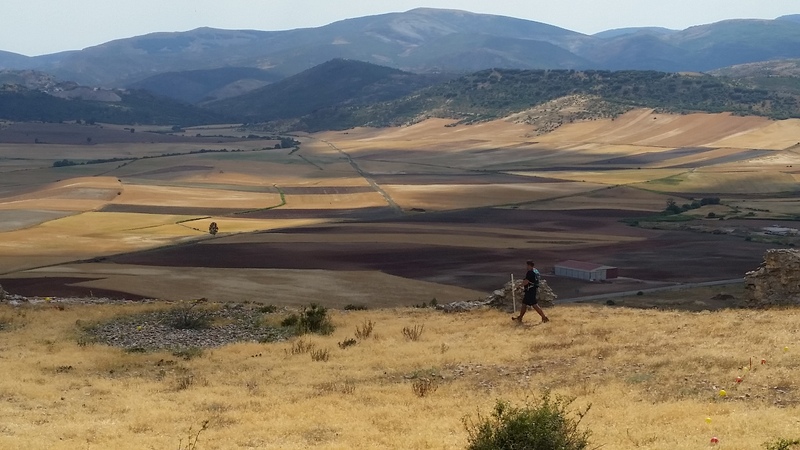 Caedmon Bradley documented the walls of the castle at Molina de Aragón with photogrammetry for his third-year dissertation. 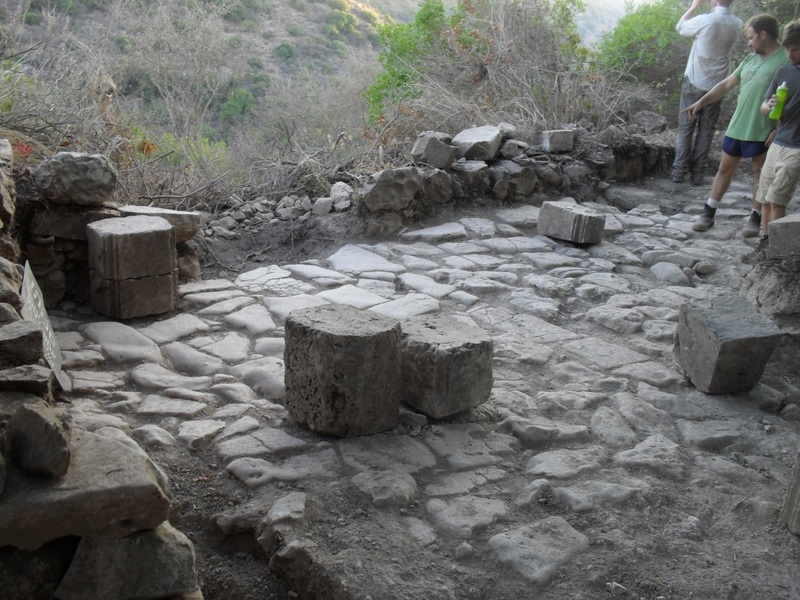 The second fortified complex included within the project – Atienza – is located within an expansive valley of the mountain range of the Sierra Norte. From the 8th century it was settled and used as a rural fortification by the Berber tribe of Banu Salim. During the Umayyad emirate and caliphate (9th c-10th century), Atienza was an important strategic centre on the border between al-Andalus and the Christian kingdoms. In 1086, the fortress was conquered and became part of Christian Castile. Subsequently, it became the centre of a frontier lordship, securing the border against both neighbouring Muslim territories and the Christian Kingdom of Aragon (11th-12th century). Atienza remained loyal to the kings of Castile in times of internal civil war (13th-14th century), and its prosperity was represented by the construction of fourteen churches, alongside the expanded castle and urban defences. From the 15th century its strategic and economic importance dramatically declined. In the 19th century it was significantly affected by the War of Independence. 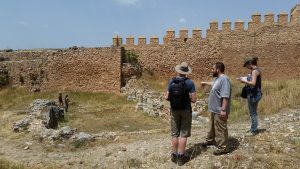 Here, Rob Fry and David Thornley conducted magnetometer surveys within the castle itself, its outer wards and some of the adjacent parts (now abandoned) of the medieval town. The aim of the surveys was to identify the degree of disturbance and the presence of buried structures where traces of occupation may have been preserved, to inform future excavations. 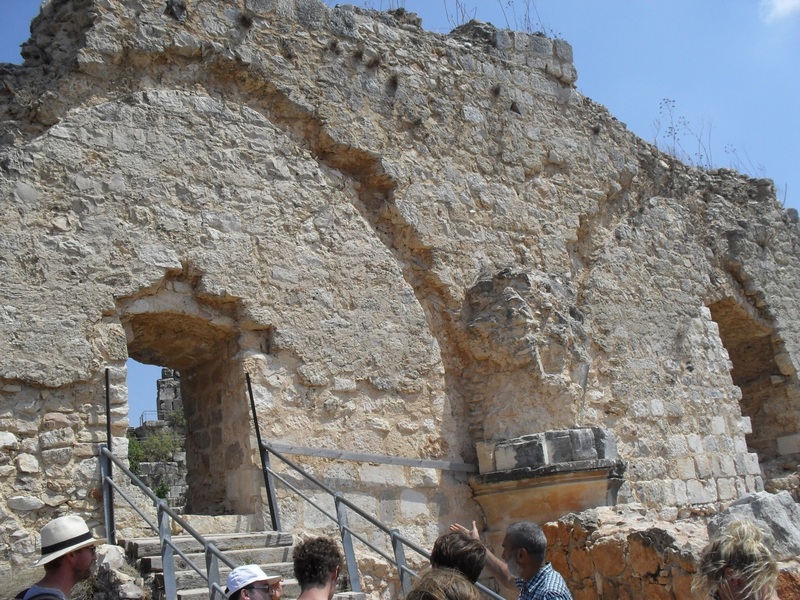 The results of these pilot projects are currently being analysed, but they represent an important foundation for more extensive future investigations into the role of these centres of authority in the medieval multicultural frontiers of Iberia. After waking up far too early and sparing way too much time to get to the airport, we were finally in the air and flying over northern Europe. It was a beautiful day and the plane journey took us about 2 hours. As we neared the end and were clearly flying over northern Poland the things that struck me were the vast dark green forests that covered significant portions of the countryside, the many lakes and the small isolated farmsteads. On landing we took a bus through the outskirts of Gdańsk which were littered with Soviet era buildings to the old town where we were staying for the night. We spent the afternoon and evening wondering around the old town. It was surprising to learn (as I am shamefully quite ignorant of modern history) that the majority of the old town had been destroyed by the Red Army at the end of the Second World War and that much of what I was seeing was in fact far newer than I had thought, though it had been reconstructed in the old Hanseatic style. This was both sad, to learn of the destruction, and refreshing to see that it had been rebuilt so well in its original style. The buildings that we saw included warehouses, churches, shops and houses. The houses and shops were particularly beautiful, as they were all painted in different colours and often had friezes detailing particular events in the town’s history, certain merchants or goods that were being sold. Seeing the old town was important because not only did it get me thinking about medieval town layouts and life there in the medieval period, but perhaps more importantly it impressed on me how relevant medieval history still is in Gdańsk, and that they recognise it as part of their heritage, enough to rebuild it in the old style out of the rubble. Our first full day in Poland started with a train journey. The train to Malbork took us through some beautiful stretches of rural Poland, and it was a pleasure to see the expanses of greenery and forests from the windows of northern Poland’s new “high speed” trains. The town of Malbork was as expected, a “soviet style” town with rows of grey, characterless block flats and gridded streets- an unfortunate result of the devastation Poland (then Eastern Prussia) faced during WW2 and the years following. 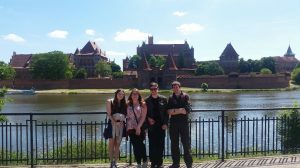 The ‘bleakness’ of the town was a dramatic contrast to the sight we beheld as we rounded the corner to Malbork’s outer walls and moat. The castle is spectacular. Breathtaking in its sheer size and construction, with the statue of the Virgin Mary proudly reconstructed, the glass mosaic dazzling in the sun. After quickly unpacking our belongings in the cosy apartments which would be home for the next two days, we met with Zbigniew Sawicki the head of the archaeology department based at Malbork castle. We had a chance to handle some of the castles artefacts; delicate locks and keys, largely intact pottery vessels all the way through to a huge swords found discarded in the moat of the castle. The castle precinct is vast, and the walk is long, but the views of the castle from the river side were truly spectacular. We were blessed with clear skies and scorching sun, which allowed panoramic views from the tower (well worth the agonizing climb). I couldn’t help but wonder to myself how phenomenal an experience this tower would have been to the men who constructed and worked on it. To see the world from a perspective no other person they knew had reached, in a time before flight, in an area void of mountains, to stand atop this tower would surely have been a life changing experience. The interior of the castle met with the exterior’s grandeur. 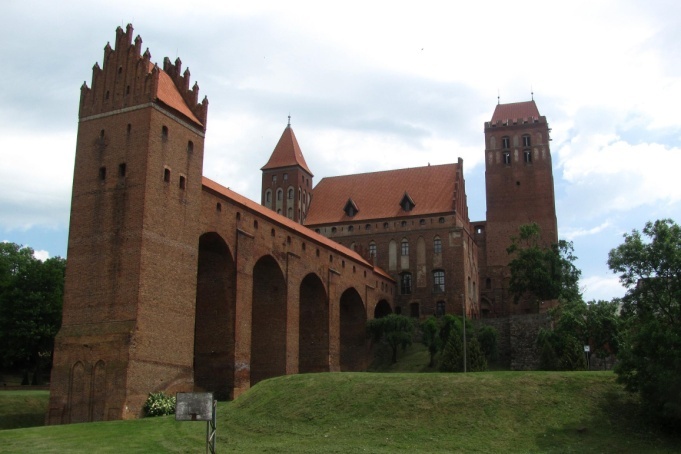 The team at Malbork have met the difficult task of preserving and presenting the castle marvellously. There is no way to summarise all of the wonderful features of the castle in just a few words, it really is a sight to behold. The tiled floors, painted arches, vaulted ceilings and not forgetting galleries filled with more amber than one person could need to see in one lifetime are second to none! 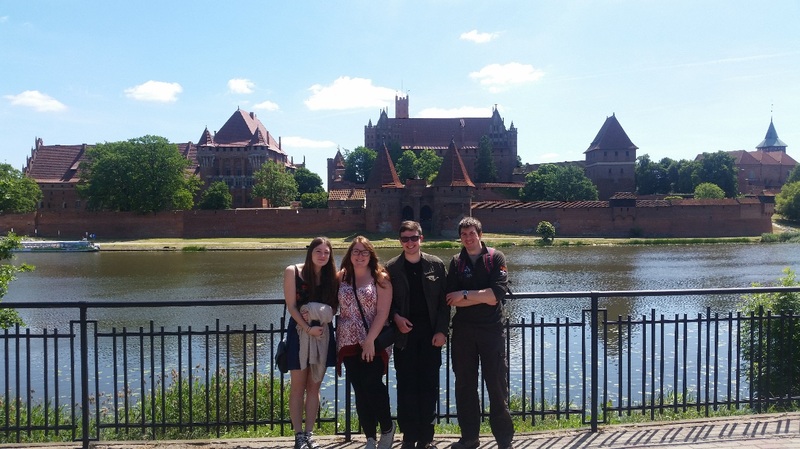 Though the day was long and tiring, our time at Malbork castle was far too short. One could spend days roaming the halls and galleries of the building and examining the brickwork fabric of the walls (a habit we had all developed by the time we left Poland!). It is truly one of the greatest medieval sites in the world. An early morning departure from Malbork saw us taking the train to Kwidzyn, about 25 miles to the south, following the eastern edge of the Forest of Sztum along the escarpment above the Vistula floodplain. 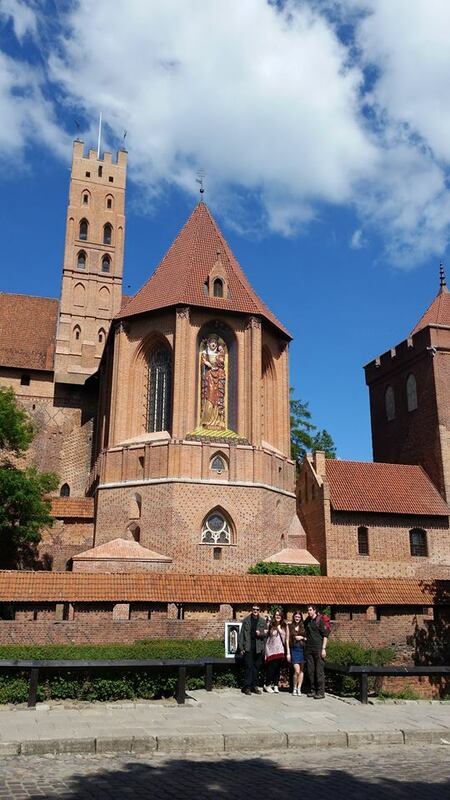 We were here to see the unusual conjoined castle and cathedral of Marienwerder, which contained one of the burial sites of the Grand Masters of the Teutonic Order. Our animated local guide showed us a display of three recently discovered burials, taking particular pleasure in the fact that the corresponding crypt at Malbork had produced no extant remains. 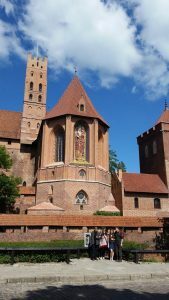 He was also keen that we see what he called “the largest brick toilet in the world”, which was in fact the latrine tower of the castle and is probably the most striking surviving example of this particular feature of Teutonic Order architecture. The interior of the castle contained an extremely eclectic museum covering everything from modern art to natural history, via a corridor that could have come straight from the Museum of English Rural Life in Reading. After a quick lunch we made the short trip to the small town of Gniew, with its imposing castle and church dominating the view from the south along the Vistula. From the outside, Mewe Castle is a classic example of the conventual style followed by the Teutonic Order in the late-13th and 14th centuries. Inside, much of the space was given over to a series of displays catering for the large number of visiting school groups (including a dungeon full of the most fiendish torture implements the 19th century mind could imagine), while the sound of children cheering as a 16th century Polish Hussar obliterated watermelons in a variety of creative ways in the grounds outside provided a constant backdrop to our visit. We had seen the continuing resonance of this period of medieval history as we made our way through Gniew’s quaint Old Town earlier in the day, where a modern monument incorporates imagery from the defeat of the Teutonic Order by the Polish-Lithuanian alliance at the Battle of Grunwald in 1410. A sudden thunderstorm heralded the end of our visit and provided the only break in the otherwise glorious weather we enjoyed during the trip, and we were glad to be able to call a taxi to collect us as the roads back to Kwidzyn began to flood at an alarming rate. 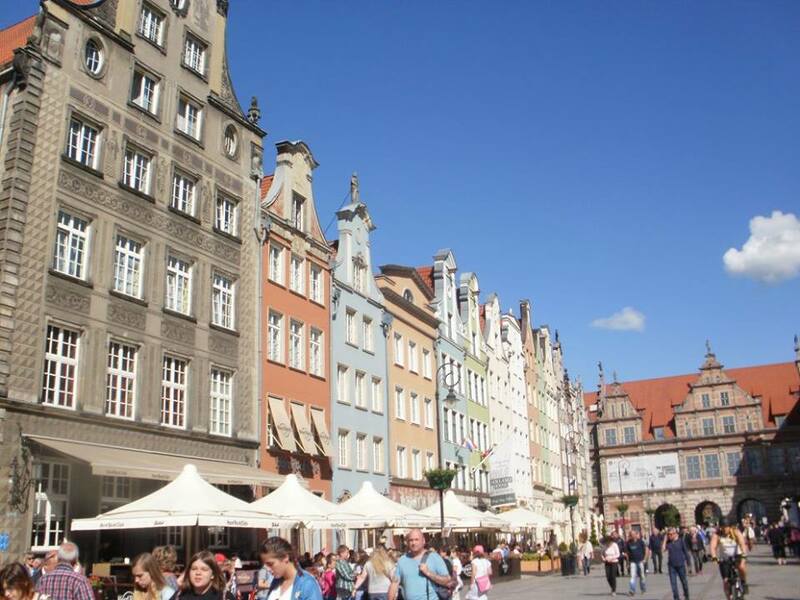 The last day in Poland was devoted to travelling. We caught the train west from Malbork to Gdańsk and, following the compulsory period of English tourist confusion over public transport in another language, we eventually made our way to Lech Wałęsa airport, where we had started our journey three days previously. I t was a wonderful fieldtrip, and we all really valued the opportunity to explore and examine the medieval sites of Poland. They brought our Baltic Crusades module to life, and immeasurably increased our understanding and learning. We had an amazing, if occasionally bizarre, time. We visited some fascinating sites, interacted with some brilliant archaeologists, enjoyed beautiful weather and, as is obligatory for travelling archaeologists, sampled the local Polish culture. Many thanks to Dr Aleks Pluskowski for organising the fieldtrip, and to all the Polish archaeologists and guides who showed us the sites and helped us to understand them. Thanks in particular must go to Zbigniew Sawicki, along with Waldemar Jaszczyński, who took the time to show us the finds from Malbork and gave us an incredible tour of the castle. James Billson, currently studying for his MA in the Archaeology of Medieval Europe, spent time this summer working at the excavations at Montfort. Read on for his report! 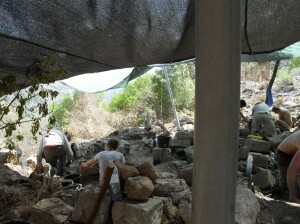 “During 2014 I was a part of the excavations conducted at the Teutonic castle of Montfort, in Northern Galilee. 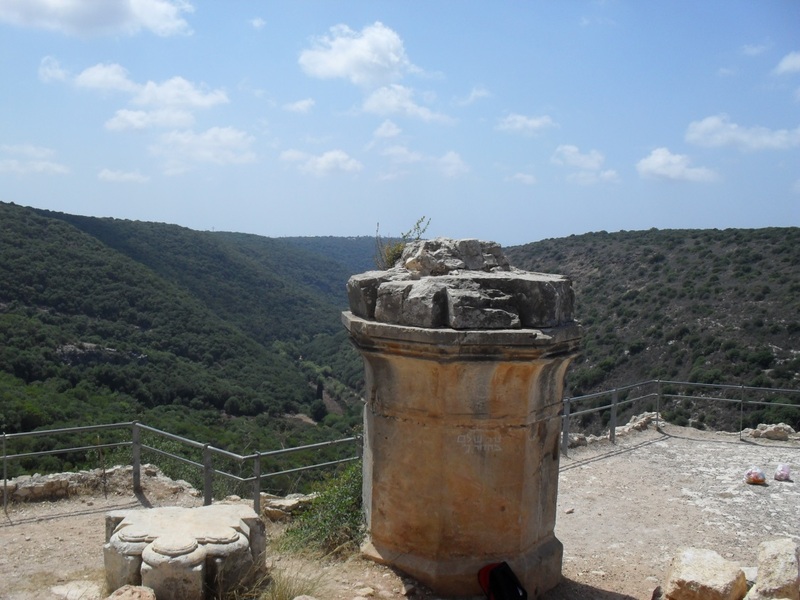 Montfort is a Mountain spur castle which takes advantage of the local topography; it is flanked by Nahal Kziv to the north and Khalet Khzam to the south. This castle was occupied from roughly 1220 to 1271; it saw two Muslim sieges, one in 1266 which it survived, and another in 1271, falling to Baybars. Chronical tell us that this spur castle served as the headquarters for the order in the holy land, occasionally being used as the residence of the Hochmeister (the grand master of the order). Figure 1: Sole standing wall of the ‘hall’. Note the staircase leading to the doorway, formerly a window which is thought to have been converted by the knights for this use. Also note the central pillar, as an indicator of the scale of this room, for more of an indicator see figure 2. Previous excavations were conducted at this site in 1877 by Horatio H. Kitchener and in 1926 by Bashford Dean (the curator for the arms and armour department of the Metropolitan Museum of Art in New York), he was hoping to recover a suit of armour. In 1994 limited excavations were conducted in the hall prior to restoration work commencing; the castle is in a state of ruin, much as it was left by Baybars following its fall. Excavation work commenced in 2011 following five years of surveying. I was fortunate enough to get a place on this excavation, which for the 2014 season focused on the area immediately behind the ‘gatehouse’ to the castle, on the slopes of the mountain. This area was thought to have been the stables for the garrisons mounts, and certainly finds including a horseshoe suggest this. I was a part of this excavation for two weeks during which time I was able to see the transformation of the site from tree stumps and slumping, to the revealing of the paved medieval floor surface, and it being reduced to its original high. Figure 3: Half removed level, when I arrived. Figure 4: Nearly fully reduced level, with ashlar blocks, parts of the collapsed archways. (Note: not in original positions, moved during excavations for ease of access). This was a fantastic opportunity for me to expand my experience within field archaeology; not only that but to increase the variety of experience that I possess, and increasing my adaptability. It is rare to find a site in England where you need to trek across low mountains in high heat! I was also able to apply lessons taught during my time at the Silchester field school with regards to taking levels! 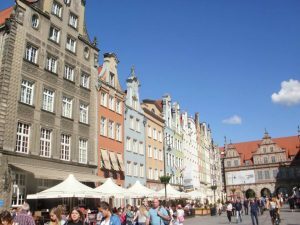 Aleks reports on a tonne of data in Poland! 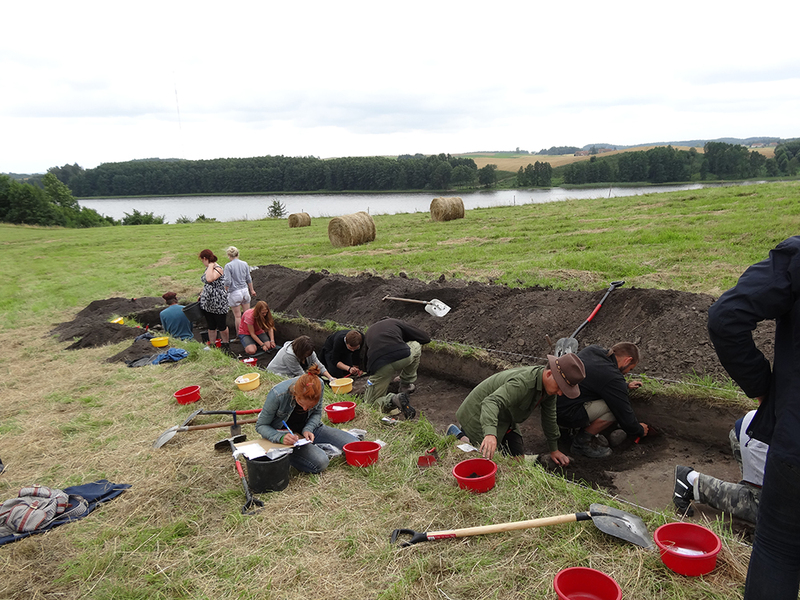 Over the last three weeks a joint UK-Polish team have been excavating the Prussian stronghold of Swieta Gora (sacred hill) in Masuria, north-east Poland, within the framework of the Ecology of Crusading project. The main focus of the excavation, now in its third season, has been the embankment at the northern end of the site, which was always assumed to be be early medieval. It turns out the embankment is 17th century, but underneath there are preserved occupation layers and features from the last phase of Prussian tribal settlement at the site, just before the region was overwhelmed by the Teutonic Order’s crusades in the 13th century. We’ve recovered a tonne of cultural and environmental data, with evidence for the exploitation of species such as bison and auroch. Last week photographer Magnus Elander was documenting the excavation and surrounding landscape as part of our outreach programme.